My.Organics was created in 2012 with the founders boasting a decade of experience in the field of hair care. The range of exclusive products is made from certified ingredients grown using organic and biodynamic farming techniques. The whole MY.ORGANICS range is suitable for all types of hair and skin. The healing powers, aromas and colours characterising each essence are preserved without the use of chemical additives, thus ensuring the products are neither aggressive or harmful. Choosing MY.ORGANICS means putting your body’s well-being first. This is the essential wet-line product. The Magical Potion protects your hair against extreme heat-damage from styling and reduces drying time by 50%. The anti-static and anti-frizz properties ensure that hair is smooth and silky whilst smelling wonderful. It is a holiday essential with its UV filter and is the perfect size for travel. 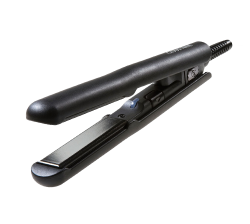 The wide super smooth plates and curved body allow you to straighten, wave or curl more hair, faster. The innovative temperature control lets you create beautiful looks only applying the amount of heat you need for your hair type – your hair doesn’t have to suffer for your style. At only 6 inches in length it makes it perfect for styling fringes and retro pin curls as well as perfect travel size hair straightener. Although this tiny treasure does not come with temperature control, the heat guard, hibernation mode and international voltage make it perfect for styling on the go. The world’s first automatic Iron offering instant heat. The touch begins working from the first stroke with no on/off switch. In addition to its buttonless design, The Touch heats automatically and reaches its operating temperature of 195 instantly. 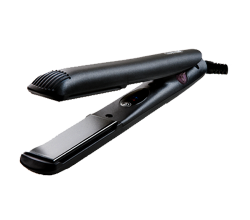 For a lower temperature, suited to finer hair or softer styles, quickly touch the plates together three times to switch to 165. The O gives your hair big volume, body & heavenly shine via ground breaking heated rollers. The Velcro rollers heat up in less that 4 seconds. The easy in, easy out rollers are kind on your hair, and being heated from the inside, kind on your fingers too! The Amplify Spray offers a weightless style preparation formula. Safely store The O in the Luxury Carry Case, with room for all your rollers & clips. 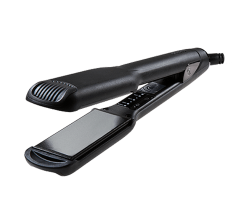 Multi award winning, the Original Iron is the straightener of choice for celebrity stylists around the globe.The innovative temperature control means you can style from a hair friendly 100 degrees to 200 degrees when only hot will do.The floating, super smooth plates and curved body allow you to straighten, curl, flick and wave without dragging or catching your hair. The Award Winning long, straight and super smooth barrel allows you to create super smooth curls. 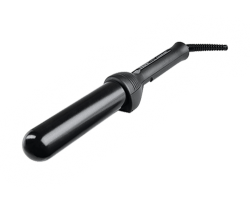 Be kind to your hair and choose the perfect level of heat with the Waving Wand’s innovative temperature control. It’s handy kick-stand means you can rest your Waving Wand without damaging your surfaces. Its tapered and super smooth barrel creates tight vintage curls, soft tousled waves and much more. Be kind to your hair by choosing the perfect level of heat from the three level temperature setting, and the unique heat-proof glove puts you in control of your style. The protective heat guard clips over the barrel to protect your Wand when not in use.